"For-Profit" Companies in India can now set up their own medical colleges in India - A decision recommended by NITI Aayog and implemented by Medical council of India. 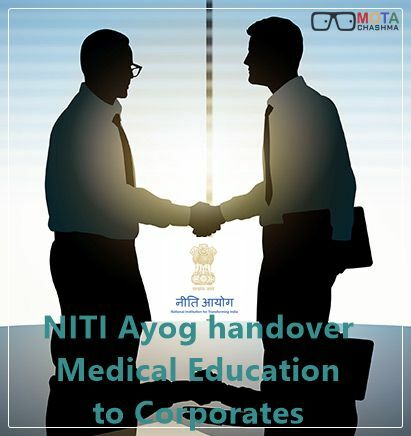 The medical education is going to reform from now onwards as NITI Ayog has proposed the replacement of MCI (Medical Council of India) and recommendation of "For Profit" companies and corporations to set up their Medical Colleges across India ,The report is designed to reform the entire system of medical education in India. The Medical Council of India has now permitted the corporates and educational institutes to take over the medical education in India by starting their own Medical Colleges. If private colleges were found to be grossly lacking and involved in fraud, NITI Aayog is going to hand over all medical education to them and calling for the reform. What members of Medical Council of India (MCI) has to say? Coimbatore-based laparoscopic surgeon L P Thanagaveluan, an MCI member who was present at the meeting, praised the decision of Medical Council of India and said “Many private institutions are anyway making profit through non-transparent and illegal means. If we legalise corporates they would charge a very high fee, but they will be forced to pay income tax." There were many recommendations from the members on how this could be done, but a majority thought it was a good idea. Some of them recommended that a portion of the seats in these institutions should go to students from economically weaker sections or to merit students entering private colleges through the state quota.” He added. The members who were present at the meeting suggested that some proportion of seats in corporate institutions must be reserved for the students who belong to economically and financially weaker sections. It is a good suggestion though but the implementation of the idea totally depends upon the NITI Ayog and Medical Council of India whether they will implement this plan or not. First Question: What will happen to the not for profit colleges who were not paying income tax and was accepting donations? Second Question: Should we allow them to convert into profit making companies? This decision of the Medical Council of India (MCI) to hand over the medical education of India to the corporates has affected many private institutions who were making money through illegal means without paying taxes and making donation based admissions. As this is a fresh idea from MCI, so every people have different opinions on the decision. But the majority thinks that it is a good idea to legalise the medical education in India.